John Archer Lejeune was born at Pointe Coupee, Louisiana on 10 January 1867. He was educated at Louisiana State University, Baton Rouge, from which he was graduated with a B.A. degree. Subsequently he secured an appointment as a midshipman at the U.S. Naval Academy, from which he was graduated in 1888. 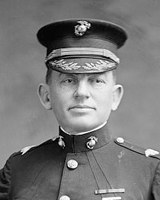 Lieutenant General John A. Lejeune, often referred to as "the greatest of all Leathernecks," during his more than 40 years service with the Marine Corps, led the famed Second Division (Army) in World War I, and was Major General Commandant of the Marine Corps from June 1920 to March 1929. During World War I he was recognized by the French Government as a strategist and leader, as evidenced by the Legion of Honor, and the Croix de Guerre bestowed upon him by that people. From General John J. Pershing he received the Distinguished Service Medal. The Navy Distinguished Service Medal was conferred upon him when he returned to the United States following the occupation of Germany. Upon the expiration of his second term as Commandant, General Lejeune indicated his desire not to retire from the Marine Corps, but was relieved as Commandant in March 1929. The following November of that year, on the 10th day of the month, he retired in order to accept the position of superintendent of the Virginia Military Institute, serving there until poor health necessitated his resignation in October 1937. In February 1942 he was advanced to the rank of lieutenant general on the Marine Corps retired list. General Lejeune succumbed on 20 November 1942 at the Union Memorial Hospital in Baltimore, Maryland, and was interred in the Arlington National Cemetery with full military honors. Today, Camp Lejeune, North Carolina bears not only the name of a Marine officer, but the name of one of the ablest officers of the American military forces, and one of the most distinguished soldiers of World War I.